God makes Man, His first priority. But, Man makes God his last resort. – Ceasar Rodriguez, Jr.
Believers are those who are aware that God is watching them. Such servants restrain their desires and prepare themselves for the Hereafter. The hijr, an obligation that lasts until Doomsday, is the road that leads from ignorance to knowledge, from forgetting Allah to seeking Him, from sin to obedience, and from obduracy to repentance. Whoever surrenders his heart to Allah alone and concentrates on this, bright sparks of wisdom will rise from his heart and pour from his tongue. As the Sept. 11 attacks tainted Islam as a religion of extremists, Tucsonan Leslie Travaglione said, she kept thinking of Muslims who didn’t fit the description. Could Islam harbor terrorists? What was this religion really all about? Travaglione kept asking herself. Her mind kept wandering back to the Muslim nurse in Mesa who had watched over her after a car accident years earlier, soon after she moved to Arizona from the Hudson Valley in New York. “She sat by my bedside, and she read to me,” Travaglione recalled. “She was so kind; she kept my spirits up all the time.”Seeking answers about Islam, Travaglione immersed herself in the study of the religion, which pulled her in like a magnet. A year ago, she became a Muslim. “I discovered that Islam is a tolerant, very kind religion,” she said. was curious: Would Saudi-grown khalasahs taste better, or significantly different? There was only one way to judge: an on-the-spot taste test. On my flight to Dammam, the nearest international airport to the oasis of al-Hasa, I carried three of my California khalasahs. They represented the best of the best, and they were there to help me make fair comparisons. Few roads in al-Hasa lead to al-Mutairfi, but those that do lead to the best of the best. Six of the leading varieties from diverse regions of the kingdom: sekki, sukkari, ‘ajwah, dekieri, nubout sayf and khlas. I also wanted to sample a broad selection of the many Saudi date varieties that I had heard about, especially the ones that are not widely available outside the kingdom. Many residents and date connoisseurs from throughout the Middle East, Asia and Africa consider the khalasah, known in Saudi Arabia as khlas, and whose Arabic name loosely translates as “quintessence,” to be the very best. Hofuf, the main city of the al-Hasa Oasis, in the kingdom’s Eastern Province, is its home, and from what I had read, the roughly 100 date growers from the Al-Mutairfi village in the oasis are considered to be the undisputed masters at growing the khlas. I arrived at the end of the date-harvest season, which lasts from May through October. Al-Hasa, known as Hajar in ancient times, covers about 20,000 hectares (50,000 acres) and it is said to be the largest date palm oasis in the world. The quality of its approximately 100 natural springs and artesian wells, some of them hot, the elaborate irrigation system, the well-drained, alkaline, sandy soils and the intense heat all make this area ideal for date cultivation, a practice that goes back at least 4000 years. The other primary date-growing areas in the kingdom are around the oasis cities of Qasim, Qatif, Bishah and Islam’s second-holiest city, Madinah, which hosts the kingdom’s most extensive date market. From region to region, the most popular dates include khlas, khunaizi, bukayyirah, gharr, shaishi and ruzaiz in the Eastern Province, and nubout sayf, sufri, barhi, sukkari, sullaj and khudhairi in Qasim and the rest of the Central Province. In the west, including Madinah, people mainly favor ‘anbara, ‘ajwah, rothanah, baidh, rabi‘ah, barhi, hilwah, hulayyah, safawi, shalabi and sukkari. Part of the reason that people in each region consider their own dates the best is because horticultural practices, soil, water and climate favor different dates in different areas. For example, the sukkari dates in al-Hasa are very good, but as a general rule, they are not considered quite as good as the sukkari dates from Qasim or Madinah. According to the Turkish census of 1871, approximately two million date palms then grew in and around Hofuf. 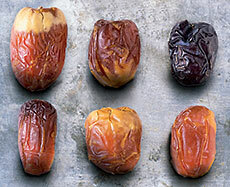 And it was at about that time that the English traveler William Gifford Palgrave described the khlas of al-Hasa as “the perfection of the date.” For centuries, khlas dates have been exported to India, Zanzibar and throughout the Middle East—but, like all premium date varieties within the kingdom, the khlas is primarily for domestic consumption. The American botanist and date hunter Paul B. Popenoe, author of the 1913 volume Date Growing in the Old World and the New, tried to visit Hofuf the year before his book was published to buy khlas jebbar, or offshoots, but the Turkish authorities could not guarantee his safety. In 1914, the date-growing region was taken from the Turkish forces by the growing power of the future founder of the Kingdom of Saudi Arabia, ‘Abd al-‘Aziz Al Sa‘ud, and since then has been under Saudi rule. Before heading south to Hofuf, I visited several retail date outlets in the Eastern Province cities of al-Khobar and Dammam. I located the upscale retail date store Batil in al-Khobar’s shiny Al-Rashid Mall. Surrounded by world-brand shops such as Estée Lauder, Body Shop, Swatch and Lacoste, Batil offered a changing assortment of 80 different varieties of dates, depending on the season. The display reminded me of a quality chocolate store where customers can select individual varieties and then have the assortment gift-wrapped. At Al-Fateh Dates in Dammam, I met owner Abdullah al-Ghamdi. He is said to be the first store owner in Saudi Arabia to make date ice cream, but what caught my eye was his selection of rare varieties of dates from the different growing regions. To my good fortune, al-Ghamdi turned out to be somewhat of a date historian. We sampled several varieties: sukkari, khlas, ‘ajwah and nubout sayf. Then I pulled out my three California-grown khalasahs for comparison. 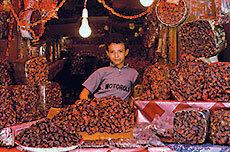 In Sana’a, Yemen, a young vendor sells dates imported from Saudi Arabia. All are sorted and priced by variety and ripeness. The following day I met a friend of al-Ghamdi’s, Muhammad Tahlawi, for whom dates are more than a matter of connoisseurship: They are one of his lifelong passions.